Usk TownThe town of Usk is steeped in history, from the ruins of a Norman castle to the seventeenth century buildings that adorn the cobbled streets. It sits on one of the finest salmon fishing rivers in the country, the River Usk. It's 11th century castle is the backdrop for an enchanting, romantic garden. Usk's charm also lies in the range of its small independent shops, tearooms and pubs, riverside walks and bulging hanging baskets and its well stocked Rural Life Museum and annual agricultural show. And its convenient location, less than 10 miles from the M4, yet feeling a whole world away. 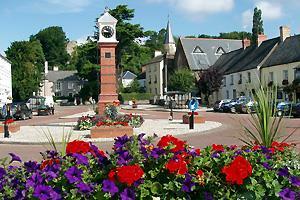 The town of Usk was founded on the site of the Roman fort of Burrium. The community grew in the 12th century around Usk Castle, built and presided over by the de Clare family, who actually planned the township. The castle is in remarkably good condition and although it remains in private ownership, it is still possible to enjoy some of its buildings and grounds. The town of Usk is steeped in history, from the ruins of a Norman castle to the seventeenth century buildings that adorn the cobbled streets. It sits on one of the finest salmon fishing rivers in the country, the River Usk. It's 11th century castle is the backdrop for an enchanting, romantic garden. Despite being raised to the ground by the marauding Owain Glyndwr in the early 15th century, Usk has always been a prosperous little market town thriving on the fertile banks of the River Usk. Today that legacy is well fulfilled with regular farmers markets and agricultural shows providing a showcase for the local produce that is considered by many in culinary circles to be amongst the best in Britain. By train: First Great Western Trains to Newport, Monmouthshire or rural services to Cwmbran in Torfaen, followed by local bus or taxi services to Usk. By bus: There are regular bus services to Usk from Chepstow, Cwmbran, Newport, Monmouth and Raglan. Travellers from outside the area should arrive at one of these destinations and pick up local services from there. By road: From West Wales take the M4 motorway east to Junction 24, then the A449 signposted to Monmouth, exit at the signposts for Usk and follow the main road (A472) for approximately 1 mile into the town centre. From London and the East take the M4 motorway west to Junction 24, then the A449 signposted to Monmouth, exit at the signposts for Usk and follow the main road (A472) for approximately 1 mile into the town centre.